On the afternoon of January 18th, Mrs. Tong Thi Phong, member of Politburo, Deputy Standing Chairwoman of National Assembly came to work with the Committee for Ethnic Minority Affairs (CEMA). Attending the working session, there are: Nguyen Duc Hai, member of the Central Executive Committee, member of National Assembly Standing Committee, President of Financial – Budget Committee of National Assembly; leader of some National Assembly’s Committees. Also, there are: Do Van Chien, member of the Central Executive Committee, Minister, Chairman of CEMA; Deputy Ministers, Vice Chairmen of CEMA: Nong Quoc Tuan; Ha Hung; Phan Van Hung; Le Son Hai; leaders of Departments, units belong to CEMA as well as the representatives of Ministry of Planning and Investment; Ministry of Finance. 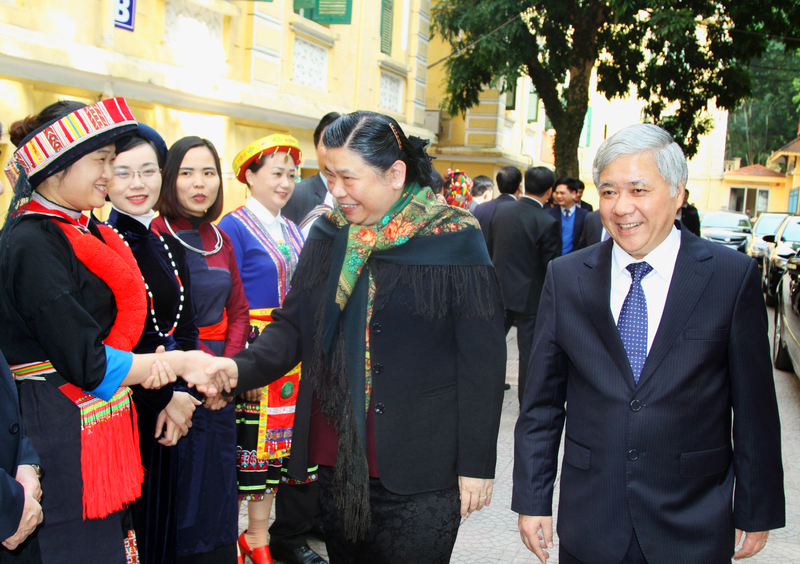 Reporting to Deputy Standing Chairwoman of National Assembly about ethnic tasks and executing them, Minister, Chairman Do Van Chien said: ethnic tasks field has received support of entire political system from the Central to Local. The Party Civil Affairs, Leader of CEMA stick closely to the policies of Party, Resolutions of National Assembly, Programs of Government and leading opinions of Prime Minister specialized and converted them into action programs, detailed plan, effort in cooperating Ministries, agencies to lead the local authority in ethnic minority area in order to deploy more tasks and solutions to efficiently execute ethnic tasks on national scale. 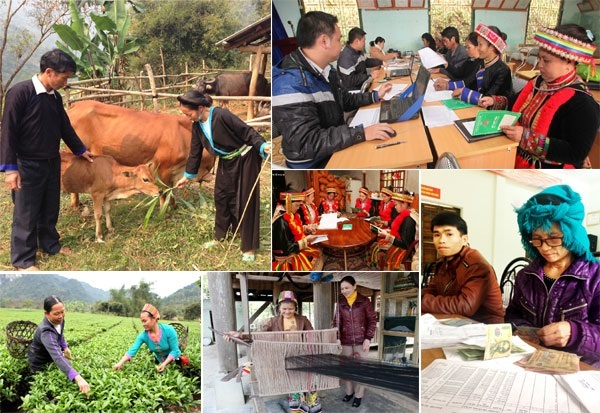 The deployment of executing ethnic tasks collected important results, contributing to the significant changes of rural area in mountainous and ethnic minority area, especially the socio-economic infrastructures. The percentage of poor mountainous and ethnic minority area is reduced from 35% (2011) to 16,8% (at the end of 2015) and estimated that at the end of 2016, it will drop to approximately 13,3%. Right now, there are 48.364 hamlets having roads to the central of commune, including 34.825 hamlets (72% of hamlets) have asphalted and concrete road. 97% plays the percentage of hamlets using electricity, including 93% of hamlets using national electric power system. At the end of term 2011 – 2015, there were 80 communes and 372 hamlets in special difficulty completing the goal of Program 135. 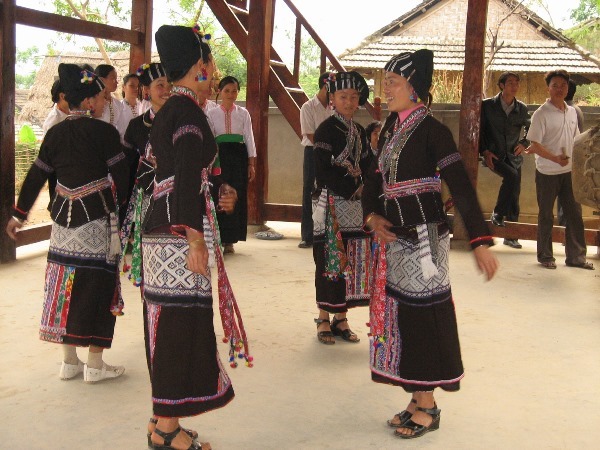 Education in mountainous and ethnic minority area have been improved; healthcare is developing; preserving and promoting the values of ethnic culture is taken care, public security in mountainous and ethnic minority area is guaranteed. About the execution of National Assembly’s Resolutions in ethnic tasks, ethnic policy, Prime Minister enacted Decision No. 755 approving Policy supporting land to build home, product, domestic water for poor ethnic minority households and poor households in communes, hamlets which in special difficulty term 2013 – 2015. Recently, we have directly supported the productive land for 18.000 households with the total of 7.000 ha, the expenditure is 160,000,000 VND; supported domestic water for over 190,000 households, the expenditure is over 250,000,000 VND; supported in building new and maintaining 330 domestic water systems which cost over 360,000,000 VND; associated with related Ministries, agencies to build “Specific policy developing society and economy in mountainous and ethnic minority area term 2016 – 2020” which is approved by Prime Minister in Decision No. 2085/QD-TTg on October 31st, 2016, counsel to Prime Minister in enacting Decision No. 1722/QD-TTg on September 2nd, 2016 approving National Aim Program in sustainable poverty reduction term 2016 – 2020, including Program 135. Minister, Chairman Do Van Chien emphasized: in the next phrase, ethnic tasks continue to aim to specific goals: decreasing the rate of poor ethnic minority households to 3-4%; the percentage of malnutrition ethnic minority children decreases to 2%; the rate of ethnic minority children go to primary school at 6 years old increases to 2%; the percentage of ethnic minority households using clean water climbs to 4%, the percentage of ethnic minority households using hygiene toilet climbs to 5%. We are going to complete general goals step by step of Ethnic tasks strategy to 2020, National Aim Program in sustainable poverty reduction term 2016 – 2020, some criteria executing Millennium Developing Aim for ethnic minority attached with the sustainable developing goal after 2015 and Resolution about pushing up the development of ethnic minority human resources term 2016 – 2020, aim to 2030. At the working session, on the behalf of CEMA, Minister, Chairman Do Van Chien proposed, petitioned to Politburo, Secretariat Committee, National Assembly, Government, Prime Minister some content: Agree to build “The Law supporting developing mountainous and ethnic minority area” and put it in the program building Law 2018 of National Assembly; launch the Summarizing Resolution No. 24-NQ/TW of Central Executive Committee term IX on ethnic tasks and enact new resolution to fit with the new situation; have scheme executing Paragraph 5, Article 70 of 2013 Institution: “National Assembly decides ethnic policy” soon; allow CEMA to build CEMA organization following the mechanism that have the participation of Leaders from related Ministries, agencies; set up enough resources executing ethnic policy in public mid-term investment plan term 2016 – 2020; National Assembly increases the supervisory tasks in programs, policies related to ethnic policy, promote the supervisory roles of National Assembly’s Representatives Delegation and of National Assembly’s Representatives in ethnic policy in mountainous and ethnic minority area. Acknowledge and commending the results of CEMA achieving in executing ethnic tasks, ethnic policy, Deputy Standing Chairwoman of National Assembly Tong Thi Phong stated: Thanks to the care of Party, National Assembly, Government, Vietnam Fatherland Front, close cooperation among related Ministries, agencies, cadres doing ethnic tasks and the efforts of people across Vietnam, ethnic policies were seriously executed and we achieved crucial results. The Deputy Standing Chairwoman of National Assembly emphasized that CEMA has done its functions tasks, power through some specific works such as: Efficiently deploying National Assembly’s Resolution; submitting policies to Government and participate in executing the developing investment policy in mountainous, border, ethnic high and important area; having opinion in building the plan of important National architecture; submitting specific policies for area in special difficulty to Prime Minister; surveying and suggesting policies for areas that suffer natural disasters year 2016 in time; counselling to Prime Minister in planning policy for ethnic group having low population; building policy for influential individuals, elder, chief of mountain village in ethnic minority community; associating with Ministries, agencies and local authority to check, preserve native culture of ethnic groups; doing well the supervisory, checking, partially summing up, summarizing and associating to enact policies as soon as possible; despite many difficulties, CEMA’s cadres doing ethnic tasks & provinces grew up, united, active and became fiercer step by step in executing given tasks; having a good relationship with cadre, people in local area; launching international conference with neighbor countries and international organizations. In the future, Deputy Standing Chairwoman of National Assembly asked CEMA to re-check in the distribution of budget in executing ethnic policy, upgrade the quality of research, counsel to the Central, Politburo, National Assembly, Government which need to be quick, up-to-date, consistent and patient; summarizing policies, build legal documents, instruction documents for policy execution; take up, commend outstanding people, influential individuals in ethnic minority community ; take care the high, border area; secure people jobs, education opportunities, health of ethnic minority groups having low population; cooperating with Ministry of Culture, Sport and Tourism, Ministry of Education and Training, cadres in related fields to counsel to Central Party, National Assembly to collect, inventory, preserve, introduce to promote the uniqueness of native culture; respect supervisory, inspectorate, check, summarize tasks of executing ethnic tasks which have focus point and answer to people’s propose; take care ethnic minority cadres, discover, cultivate and training human resource. The Deputy Standing Chairwoman of National Assembly Tong Thi Phong asked National Broad of National Assembly, National Assembly’s Committees to associate together to check, supervise the execution of ethnic policy to report to the National Assembly Standing Committee. The Deputy Standing Chairwoman of National Assembly emphasized: Need to determine that ethnic task is important content in the strategy of developing society and economy of Vietnam, building and protecting nation. From the reality of our country in Innovation era, we need to focus on socio-economic development, culture, education, raise people’s intellectual level, reduce poverty level, protect ethnic groups’ right and legal benefits. On the occasion of preparing 2017 Tet holiday, on the behalf of Leader of National Assembly, Deputy Standing Chairwoman of National Assembly Tong Thi Phong sent compliments and wished the best wishes to cadres, officials, employees in entire agencies system doing ethnic tasks. 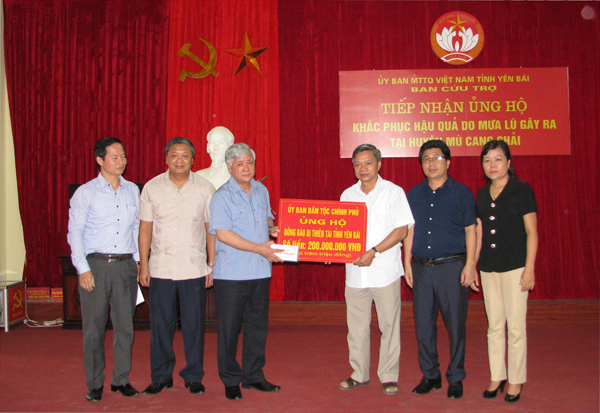 On the behalf of Leader of CEMA, Minister, Chairman Do Van Chien acquired leading cadres of Deputy Standing Chairwoman of National Assembly Tong Thi Phong as well as stated CEMA will continue to cooperate with Ministries, agencies in researching, building appropriate policies and promoting the development in mountainous and ethnic minority area.